A suburb is semantically defined as a residential town where people live within commuting distance of a larger city, and Bukit Mertajam fits that description perfectly. “It’s a town with great food. And, many of the hawkers still prepare their food traditionally,” said Zeon Properties Group chief executive officer Leon Lee. The morning market in the town centre has an astounding variety of perishable goods, being a major food distribution hub for Penang’s mainland. “Bukit Mertajam is a convenient and yet affordable suburb for people to own and live in comfortable condominium units,” he said. Zeon is the marketing consultant for Prominence, the classiest condominium project that is being constructed in Bukit Mertajam. 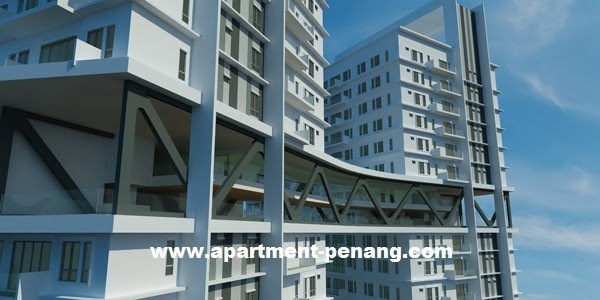 The condominium sits off Jalan Permatang Batu, near the Jalan Bukit Tengah and Jalan Baru roundabout outside Bukit Mertajam town. Only 7km of highways and dual-carriage roads stand between Prominence and the Penang Bridge, making it a breeze to get to the island. Once completed, Prominence will comprise two 34-storey towers with a connecting sky bridge, 19 double-storey retail outlets and 24 triple-storey shop offices. The sky bridge will be two-storey, between levels 27 and 28 and it will house a dining pad, lounge, karaoke, outdoor and indoor gymnasiums, yoga deck and reading patio. Down on the patio, residents will be endowed with an infinity swimming pool, kids’ pool, aquatic gym, Jacuzzi, boardwalk, garden cabanas, putting green, indoor badminton and outdoor three-person basketball courts, multi-function area, children’s playground and BBQ patio. Where economics are concerned, the price is certainly a steal. At an average price of only RM600 per sq ft, the 412 available units are going at as low as RM380,000. The units are ‘family-sized’, from 1,100sq ft to 1,500sq ft.
“We have discerning luxury condominium buyers who are accustomed to the quality of properties on the island being built on the mainland at a lower price. This is a good growth strategy for Penang and I expect to see many more similar developments taking place in the Bukit Mertajam area,” Lee added. Bionic Development Sdn Bhd, a subsidiary of Metech Group Berhad, is developing Prominence. The Metech Group started as a humble metal foundry business in Penang in 1955 and has since diversified into property development. Prominence will be showcased at Star Property Fair 2014 at Gurney Plaza and the adjoining G Hotel.